This is a monumental solo piano album (2 CDs) by the Polish pianist / composer Piotr OrzechowskiFind albums by this artist (a.k.a. 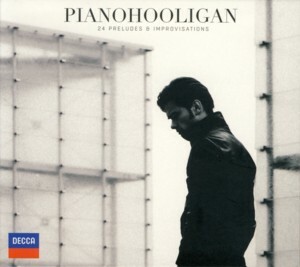 PianohooliganFind albums by this artist), which presents twenty four preludes composed by him, each of them followed by an improvisation connected to the prelude; altogether forty eight short pieces of music, sequenced in the order of the chromatic scale from C major to B minor. This is Orzechowski´s fourth album for the Classical DeccaFind albums on this label label, which consistently and faithfully supports his career. The music beautifully portrays the two faces of Orzechowski´s musical personality, rooted on one side in Classical Music ranging between Johann Sebastian BachFind albums by this artist and Krzysztof PendereckiFind albums by this artist and on the opposite side in Jazz and Improvisation. Although perfectly capable to stand on its own, this music is much better understood when seen (or rather heard) in the full scope of Orzechowski´s recordings, as presented on the abovementioned Decca albums. But even for a person completely unaware of Orzechowski´s background and recording legacy, it should be immediately apparent that this is a great Artist at work, both as a composer and as a performer. The scope of his imagination, intelligence, musical depth and aesthetic perfection is evident in every one of these forty eight miniatures. Listening to this music is a deep, almost spiritual experience, which should leave no music lover indifferent. This music is immensely multilayered. It can be experiences on its exterior layer, but it can also be probed into the inner layers, which reveal intricate complexities in both the composed preludes and the improvised pieces. As such this music should require repeated listening sessions to be explored in depth. Overall this is a masterpiece of contemporary Polish music, which proudly represents the incredibly high level of musical creativity and talent, which many young Polish composers and musicians are blessed with. For people unfamiliar with the treasures of Polish Music, this album could be a wonderful window into what is happening in Poland today. Brilliant stuff!